Matching the Solitare in weight, the Mithras is the Clan's relatively quick, lightly armored tank unit. 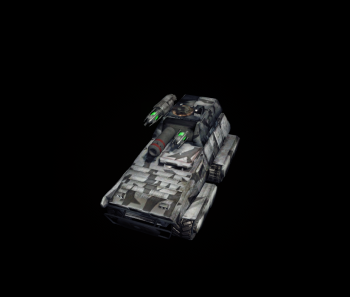 Flexible enough from fitting in the roll of a ultra long range harasser to a close range brawler, all the Mithras variants are inexpensive tanks that are available at the beginning of TC matches. Be wary though, it does not have the armor to go toe to toe to with most other assets. An excellent scout tank available with starting C-bills its dual ER-Medium Lasers and the CUAC5 can deal respectable pinpoint damage to light 'mechs. However the rate of fire is sub-par, and the autocannon can jam easily with repeat firing. The Prime is better suited to cutting off weaker components such as arms or legs, or already damaged torso pieces. 1v1 engagements should be avoided, as at best it will only be an even fight. 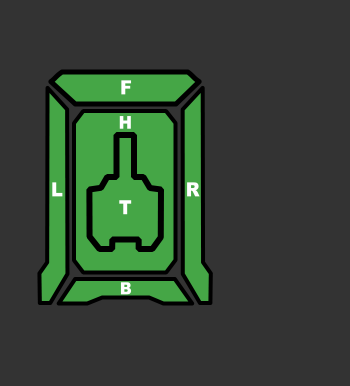 Rather, use your speed to capture undefended bases, and engage targets alongside your comrades making sure to use them to protect your very light armor. A free ton for an extra magazine of UAC5 ammo allows for greater freedom with the trigger, though can be careful to avoid a jam. With a 900m range and hard hitting power of its clan ERPPC aided by EOptics, the A variant's primary roll is sniping. Its twin clan small pulse lasers and dual flamers serve as close-in backup weaponry while the cERPPC recharges. Though, it's best to keep your enemies at long range though as this variant can't take much punishment going toe to toe with another brawly light asset. If caught at close range against an opponent with laser weaponry, use the flamers as your primary weapon to overheat them. Battlearmors are also easy picking for the flamers. A pure brawler, this Mithras can dish out some serious damage in an alpha-strike. Set to chain fire, its fast reloading twin ATM3 High Explosive deliver screen shake every 2 1/2 seconds while the trio heavy lasers bore deep into enemy armor with precision. Keep your aim steady to rip enemy limbs off in short order. Always use cover to close the distance to surprise your prey as the Mithras doesn't have the raw speed to keep up with the faster light mechs. Keep in mind that its armor is thin, rotate damaged sides away from your enemy to survive. The only Mithras to equip GECM, the C is the most stealthy variant available. It also is a dedicated close in brawler with its dual CMPL and dual CSPL, easily surprising opponents by running passive radar for quick pin-point strikes. 3 heatsinks help keep the pulse laser assault going for a good time before reaching critical heat temperatures. Reposition yourself often, using cover to help mask your different approaches. For added protection against enemy missiles the C is equipped with LAMS just be mindful that when in range for the LAMS to function it is also giving away your position. A flexible unit at all ranges, the Mithras D will comfortably fit in as a multi-role harasser taking on both ground and air assets. EOptics aid for laying down accurate long 1x CERLBL / medium 1x CERMBL range laser blasts targeting vulnerable enemy components. When you find yourself close up, the CSRM4 and CSRM2 open up to help finish the job. This unit woks well in a Pack or Back Capping. Just like the C, it is equipped with LAMS just be mindful that when in range for the LAMS to function it is also giving away your position. With only room for 2 HS watch your temperatures. Based on the single cUAC10 as a medium range, high damage dealer, the Mithras E can do significant burst damage. As the cUAC10 shell speed isn't the fastest, hitting fast targets can be difficult at range. Thus, the E is best used against slow movers where it can really shine. The machine guns serve as backup against Battlearmor and can be used to harass distant targets. Any pilot with a steady hand should climb into the Mithras F and give it a spin! Boasting the heaviest single burst damage weapon of all variants with the scalpel-like heavy large laser, this variant will cut through armored components with ease. Bring your opponent into close range to feed them chain fired screen shake from its twin CSSRM2s. Watch the heat and use good positioning to surprise your enemies. An ultra-long range sniper, the Mithras G will lay down accurate hyper assault gauss rounds all the way out to 1200m. Fire its HAG20 till it jams as it is designed to recycle more quickly that way. The suppressing fire capability of this variant will disrupt most opponent's operations, getting them to run for cover under the hail of fire. The Mithras Light Tank is a combat vehicle that was originally intended to be a scout in addition to its place on the battlefield as a swift, light tank that is capable at all ranges. Its usefulness as a reconnaissance vehicle has been reduced with faster vehicles that field more advanced electronics. Capable of speeds up to 97 km/h, the Mithras can keep up with most units, while still providing respectable firepower with decent armor. Though that protection is only three tons worth, it is improved through the use of Ferro-Fibrous technology. This page was last edited on 22 March 2019, at 20:28.